Chronic Wasting Disease (CWD) is a contagious neurological disease that is fatal to deer, elk and moose. It is classified as a transmissible spongiform encephalopathy or TSE and it attacks the brains of infected animals, resulting in their becoming emaciated, exhibiting abnormal behavior and eventually dying. Related animal diseases include scrapie, which has been identified in sheep for over 200 years; and bovine spongiform encephalopathy, or "mad cow disease," in cattle. See also: Help Our Herd! While New Hampshire works to protect wild and captive deer and wild moose, it is important that hunters understand the potential risks CWD poses to our deer and that they be aware of the rules and regulations in New Hampshire and elsewhere designed to minimize the potential threat from CWD. NH Fish and Game prohibits the importation of live white-tailed deer and moose into New Hampshire, and the NH Department of Agriculture closely regulates the importation of other live cervids (members of the deer family), requiring them to meet both state and federal animal health standards, including CWD-free herd certification. In addition, NH Fish and Game prohibits the importation into the state of hunter-killed cervid carcasses or parts of carcasses from the jurisdictions in which CWD has been detected, except for de-boned meat, antlers, antlers attached to skull caps from which all soft tissue has been removed, upper canine teeth (a.k.a. buglers, whistlers or ivories), hides or capes with no part of the head attached, and finished taxidermy mounts. These regulations are designed to minimize the risk of New Hampshire's deer and moose being exposed to CWD through the importation of an infected animal, or the disposal of brain or nervous tissue, lymph nodes, bones and other tissue from an infected hunter killed animal. The disease agent of CWD, an abnormal protein called a prion, is very stable and could easily be spread if diseased deer parts were disposed of in our environment. Why Are Import Restrictions So Important? The figure below shows the home zip codes of successful hunters who hunted in Wisconsin’s CWD management area during 2016 and 2017. This shows the potential for hunters to spread CWD infected materials from their harvested deer if they do not follow New Hampshire’s mandatory import restrictions. When you consider that this is only 1 of 29 CWD positive jurisdictions in North America you can see the important role hunters can play in either helping to contain the disease or possibly spread it further. Please be a part of the solution and help stop the spread of this devastating disease by knowing and following restrictions in your home state and any other states you may choose to hunt in. Please don't feed deer! The artificially high deer densities associated with feeding create the potential for increased spread and prevalence of CWD, both from infected feed and close contact among individual deer. Deer feeding provides limited benefits to deer but adds significantly to the risk that disease could be spread more quickly and widely. **New York is no longer considered a CWD-Positive Jurisdiction by NH. However, New York-killed deer still may not be transported through Massachusetts or Vermont. See FAQs for more information. Following are Frequently Asked Questions about New Hampshire and CWD. Click on a question to view the answer. Can New Hampshire hunters import carcasses of deer killed in New York? New Hampshire now permits importation of whole deer from New York. Regulations in Massachusetts and Vermont still prohibit the importation of deer carcasses from New York, however, and these regulations include the transport of New York-killed deer carcasses through these states. New Hampshire hunters are warned that simply crossing these states with a deer carcass from New York remains a violation and could result in legal prosecution. As a consequence, New Hampshire Fish and Game recommends that hunters continue the past practice of deboning New York deer. Does CWD Pose a Risk to People? Information to date from the federal Centers for Disease Control (CDC) and the World Health Organization (WHO) indicates that people, cattle and other livestock are resistant to transmission of CWD. There have been no verified cases of people getting the human form of TSE known as Creutzfeldt-Jakob Disease (CJD or variant CJD) from exposure to CWD, even though hunters have been taking and eating deer and elk from the infected areas of Colorado and Wyoming for more than 20 years. New cases of CJD continue to be investigated, but to date, none have shown a link to CWD. While CWD is not known to be present in New Hampshire and appears to pose no known threat to human health, hunters can take some simple precautions to minimize possible exposure to CWD and other common wildlife diseases. How is CWD Transmitted Among Cervids (Members of the Deer Family)? CWD is not the result of a virus or a bacterial agent. It is caused and transmitted via abnormal proteins called prions. These infectious prions are most likely transmitted through physical contact, (such as nose to nose), through infected feed, or through environmental contamination, for example, through feces or urine. Abnormal prions tend to be most concentrated in nervous system tissue such as the brain or in lymphatic tissue such as lymph nodes in deer. Other affected tissues and organs can include the eyes, spinal cord, tonsils, pancreas and spleen. Why is Fish and Game Concerned About CWD? If CWD gets to New Hampshire, it could affect the health and population levels of our wild deer and moose herds and captive deer and elk herds. CWD is a serious issue and our mission directs us to take a stewardship role with regard to wildlife species. We care very much about the potential impact upon native herds as well as captive deer herds and we recognize the potential impacts on one of our proudest traditions -- deer hunting and the economic engine it provides for New Hampshire. It would be irresponsible of us to do nothing. Our strongest desire is to prevent the disease from entering our borders. What is Fish and Game doing about CWD? At the present time, it seems wise to strive for the most protective measures possible. Specific objectives for New Hampshire include 1) disease prevention; 2) early detection; and 3) disease control (or eradication if the disease is found in NH). To accomplish these objectives, the NH Fish and Game Department has been working with the NH Department of Agriculture, the Northeast Deer Technical Committee and federal agencies. We hope to minimize the risk of CWD entering New Hampshire by reducing the chances of a CWD-infected animal, living or dead, entering the state and possibly infecting our wild or captive deer. NH Fish and Game conducts CWD monitoring and surveillance in wild deer, and the NH Agriculture Department has a testing program for captive deer and elk, so that we'll know as early as possible if CWD does get to New Hampshire. To date, CWD has not been detected here. 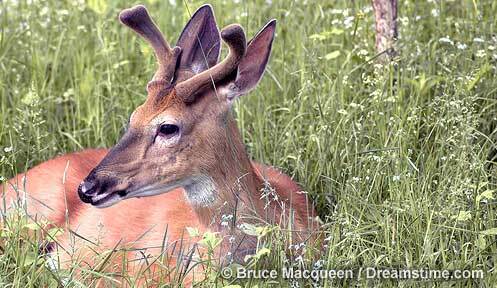 New Hampshire Fish and Game began a CWD monitoring and surveillance program for wild deer in the fall of 2002. Hunter-killed deer are sampled and tested as part of a nationwide monitoring and surveillance effort. In 2017, 444 samples were collected and submitted to a USDA-certified laboratory for testing. Results indicated that all samples taken during the fall 2017 hunting season in New Hampshire tested negative for CWD. In all, 6,261 deer have been tested for CWD in New Hampshire since 2002, with none testing positive; the testing program will continue into the future. The New Hampshire Department of Agriculture has a separate monitoring program for captive cervids. When was CWD first found in the U.S. and what's being done? Chronic wasting disease was first identified in 1978 and remained isolated in Colorado, Wyoming and Nebraska for about a decade. It is a neurological disease affecting deer and elk and is similar to mad cow disease. However, the World Health Organization has concluded that there is no evidence that people can catch CWD. A nationwide effort is underway to prevent further spread. This effort includes collecting annual samples of deer brain or lymph node tissue to monitor populations. NH Fish and Game has been collecting samples from about 400 deer each year as part of ongoing monitoring and surveillance efforts. Do urine-based lures pose a threat of spreading CWD? Urine used to produce commercial deer lures is often from farm-raised deer and elk. Low levels of the infectious prion that causes CWD have been detected in urine, and therefore it is possible that these prions may be present in urine-based lures if collected from infected animals. If CWD prions are present in urine-based lures, and these lures are placed where deer can come in contact with them, it is possible that New Hampshire's deer population could contract CWD from this source. Research suggests that prions can remain unaffected in the soil for years, remaining a source of possible exposure and infection for NH deer. It is not known if any deer/elk used to produce urine-based lures have ever contracted CWD, and deer lures are not currently being tested for the presence of CWD prions. Until research is conducted that shows urine-based lures are not a threat of spreading CWD, we strongly discourage their use. There are many effective synthetic deer lures on the market today that can be used in their place. Where can I find more information on CWD? The Chronic Wasting Disease Alliance has developed a website (www.cwd-info.org) which is acting as a national clearinghouse for the most up-to-date and accurate information on CWD. There is an abundance of information available on that site, and it offers many links to other sites including state and federal agencies and non-governmental organizations that are involved with CWD management or research. Those hunting in CWD-positive jurisdictions MUST follow the regulations regarding deer, elk or moose carcass importation into New Hampshire. You can bring back ONLY deboned meat, antlers, upper canine teeth and/or hides or capes with no part of the head attached. Antlers attached to skull caps or canine teeth must have all soft tissue removed. Help keep New Hampshire CWD-free -- it's the law. If you hunt deer or elk in other states and provinces, particularly those in which CWD has been detected, you should check with their state fish and wildlife agency to see if they have any specific advice to hunters or special regulations. Wear rubber gloves when gutting or butchering deer. Never eat a deer's brain, eyeballs, spinal cord, spleen, or lymph nodes. Avoid cutting through bones or the spinal column. If you saw off antlers or through a bone, or if you severe the spinal column with a knife, be sure to disinfect those tools prior to using them for the butchering or removal of meat. Remove all fat, membranes and connective tissue from the meat. Note that normal field dressing and trimming of fat from meat will remove lymph nodes.